Ultrasound differs from the modalities discussed in the previous three chapters in that it transmits energy that falls within the acoustic, rather than electromagnetic, spectrum. Ultrasound is used in medicine for imaging as well as in the treatment of musculoskeletal conditions. The success of eccentric exercise for the treatment of tendinopathy is an excellent example of mechanotransduction at work. The tendon fibroblast (tenocyte) is the predominant cell found in tendon and is responsible for producing the components of the ECM and maintaining tissue homeostasis. A 28-year-old female tennis coach and player is referred for care, complaining of neck pain following a motor vehicle accident 6 days ago. She was at a complete stop when her car was hit from behind. She was transported to the emergency department at a local hospital. She was discharged after being evaluated for injuries. Therapeutic Modalities for Musculoskeletal Injuries, Fourth Edition With Online Video, offers comprehensive coverage of therapeutic interventions for musculoskeletal injuries, providing the tools for optimal decision making for safe and effective use of each treatment method. Therapeutic Modalities for Musculoskeletal Injuries, Fourth Edition With Online Video, contains many learning features to assist comprehension, including chapter objectives, key terms and a glossary, sidebars with clinical application of current concepts, and chapter summaries. Additionally, access to 21 online videos of applying modalities in clinical practice will help students better understand concepts from the text. For instructors, a robust set of ancillaries is provided, including a fully updated test package and instructor guide, as well as a newly added presentation package plus image bank to assist with lecture preparation. 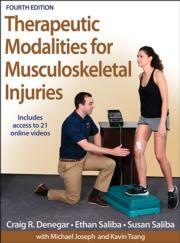 Ancillary material can be accessed online at www.HumanKinetics.com/TherapeuticModalitiesForMusculoskeletalInjuries.